The Alpine 6 uses 170mm travel upfront and with the introduction of the 230mm metric shock, we have revised the suspension layout to increase the rear travel to 165mm. We've also tuned the frame to be more progressive to retain a bottomless feel and improve small bump smoothness, treading that fine line that keeps wallow at bay and gives the Alpine 6 all the control it needs. The geometry has also been under the microscope and refined to match the new suspension performance, resulting in more agility, stability and confidence at speed. Our ethos is evolution not revolution, but the sum of all the changes offers huge gains in performance. The head angle is now half a degree slacker than its predecessor, the BB is 5mm lower and we’ve added 6mm to the reach (Size L). In addition we’ve added 11mm to the chainstay, which has helped centralise a riders weight on the bike during both descending and climbing, offering a more balanced feel. We also reviewed our sizing dropping the XS but making the S we already had smaller covering both sizes. We’ve also added in a XXL size and reduced the XL seat tube length to a 19 inch. We’ve worked on the smaller details as well, our cable routing has seen an overhaul to be easier on the eye and keep those big loops to a minimum, we’ve also used frame grommets which mean whether you run your brakes "British” or "American/Euro” you can now do so without compromising your routing. All the CNC parts on the frame, upper and lower shock mounts, dropouts and bearing housings have all seen revisions. 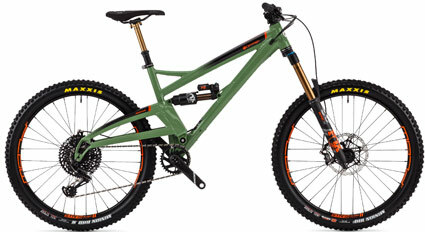 So when you come upon one of those unholy beasts of a trail, this is the bike to take it on at full-gas and tame it.